Detail crop from ca. 1905 postcard by J. J. Coffey. Image courtesy of Bobby Brendell Postcard Collection, Digital Watauga. Completed in December 1889 by William Stephens (1870-1945) of Mayfield, Kentucky for $5,000, the Watauga County Jail was the fourth jail building to serve Watauga County and is Boone’s only surviving local government building from the nineteenth century. Like many small-town jails of the period, this building was actually a mixed-use space, with both floors of the rear half of the building being used for jail purposes and the front half set aside for the residence of the jailer and his family. 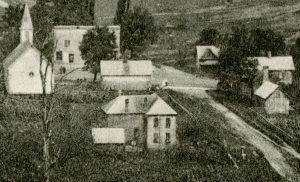 The building continued in service as a jail until 1925, when a new jail building was opened behind the 1904 Watauga County Courthouse, then located about half a block to the north on the site of the present courthouse. After a short stint as an apartment house, the 1889 Watauga County Jail was converted to a single family residence in 1937, with many (though not all) of the interior accoutrements of the jail setting removed to facilitate these changes. During the late twentieth century, owners again converted the building to apartments and rented it to ASU students, who inflicted a heavy toll on the interior. In more recent years, owners converted the building into a first-floor restaurant with an apartment upstairs, a configuration it maintains today. The 1889 Watauga County Jail is a classic example of a Folk Victorian-style home adapted to rural institutional needs. 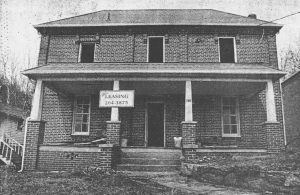 Originally “T” shaped in design, with a hipped roof, two-story main block that resembles an I-house and a hipped roof, two-story, rear (west) extension, the building is constructed of common bond red brick that was kilned by Stephenson on site and arranged in a 6 to 1 ratio of stretchers to headers. Sturdy brick pilasters separate the three main bays of the front (east) façade and are present at the corners, with the east elevation terminating in a quadruple-tier, English bond, corbelled cornice that is interrupted at irregular intervals by brick brackets. Stunted brackets are centered on the pilasters, while a pair of elongated brackets frames each window opening of the second floor. A second, alternating corbel line separates the first and second floors but is mostly obscured by the front porch. The roof is clad in small, metal shingles that may be original to the house. Some past accounts of this house have suggested that the house did not originally have a front porch, but images from circa 1905 clearly show a porch of this approximate massing was present relatively early in the building’s history. That said, this porch has been modified numerous times in its history. The current version features salvaged material from a 1920s Blowing Rock home that creates the three-season functionality; this change occurred in the early 2000s. 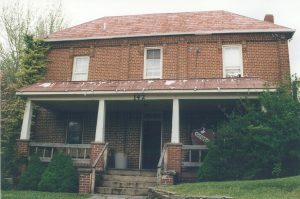 Watauga County Jail as fraternity house, ca. 1988. Image courtesy of the North Carolina State Historic Preservation Office. While the interior of the former Watauga County Jail has been much altered since its use as a jail ceased in 1925, a number of important design elements remain in the interior. Cells at the 1889 jail were located on both the first and second floor, primarily in the rear or “T” portion of the building. Many of the original interior brick walls associated with the jail space are up to 18 inches thick, purportedly to make escape much more difficult, and these walls survive to this day. There is some dispute about whether men were held upstairs or downstairs, as well as just how many cells there were, but the first floor cells had concrete floors overlaid with wood, which prevented inmates from tunneling out through the floor. Evidence of one jail cell is still visible on the first floor, where the steel doorjamb and lintel of the doorway leading into one of the jail cells on the first floor is still intact where the bar and bathrooms are today. During renovations in 1986, a new buyer removed stucco from the walls in the first-floor jail cell area and uncovered decades of graffiti from former inmates; while much of this original graffiti survives, uncovering these historic artifacts allowed the various college students who lived in the building over the next fifteen years to add their own graffiti to the mix. The 1889 Watauga County Jail is currently under evaluation for nomination to the National Register of Historic Places and possible designation as a Local Historic Landmark. Portions of this text are taken from the forthcoming Downtown Boone Historic Resources Survey Report written by Eric Plaag.